If the overused and undervalued word “awesome” is applicable today, it is regarding the people of Boston when they were faced by the recent violence in their city. In their cradle of America’s democracy, we witnessed in them that the self-reliance patriots dreamed of. Faced with terror and death, there were no calls to arm each and every person with guns. No citizens grabbed for the weapons of war. There were no trumpets to hate government. There was no fomenting of distrust in leadership. All that was the terrorists’ do. What the people of Boston seized upon was their self-reliance in government, their self-support for enlightened leadership, and their own militia-style spirit of organized cooperation, that didn’t require their personal guns. In victory’s end, the people of Boston cheered their champions, welcoming them with ever more dedication and support, as they now reassemble in the swelling pride of their community. 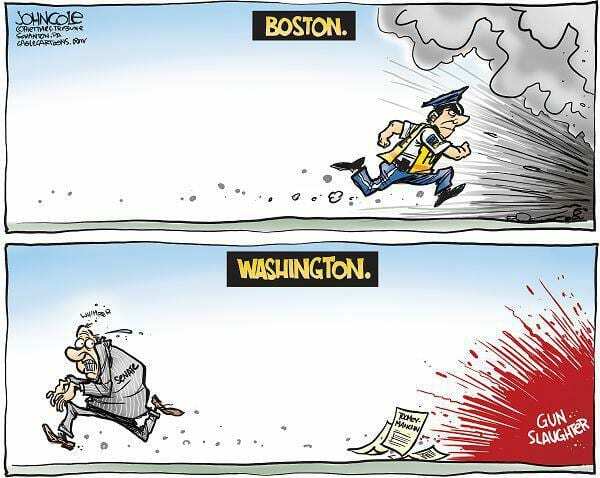 Boston shows us the American way.